U.S. 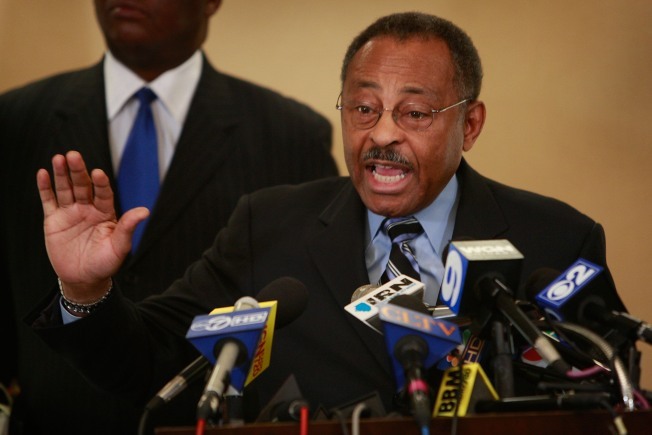 Senator Roland Burris in one of many recent press conferences trying to contain expanding scandal of possible perjury in statements he has given on his relationship with former Illinois Gov. Rod Blagojevich. Talk about being snakebit. Looks like Senate Majority Leader Harry Reid was right the first time. He did everything possible to block Roland Burris from taking office last month. Yet boxed in by then-Gov. Rod Blagojevich's legal appointment, the lack of any evidence to suggest Burris was inherently corrupt -- and the awkwardness of the all-white U.S. Senate blocking a black man from taking a seat. Add to that, the entire affair was a distraction to President-elect Obama. He began working behind the scenes to resolve what was becoming an increasing embarrassment. Realizing there was little they could so, Reid and the other Senate leadership agreed to seat Burris. That decision has now royally blown up in their collective faces -- Burris' story on what communication he had with -- and fundraising he did for -- Blagojevich prior to the appointment has changed more times than tires at a NASCAR event. Multiple investigations -- including the Senate Ethics Committee -- into Burris' statements and actions are now underway. Both of Burris' "hometown" papers -- The Chicago Tribune and The Washington Post -- have called for his resignation. Harry Reid is stuck with a walking ethical stink-bomb that has exploded in his caucus. Burris' public attempts to defend himself go from sublime to ridiculous to Kafka-esque. Reid finds himself with a major PR headache whether Burris stays or Burris leaves. Indeed, the only other person for whom Burris creates a greater headache is President Obama. Technically, that shouldn't be the case. He's out of the Senate and has a heck of a lot of other matters on his plate than who is representing his home state. Unfortunately, life doesn't work that way. Burris still sits in what was previously the Senate seat of the man who is now president of the United States. (And, again, Obama signed off on the appointment when the prior attempts to block Burris started getting ugly.) Blagojevich was caught on tape talking about the importance of the seat -- and why the appointment shouldn't be "given away." Obama's former seat is, symbolically, a great prize. Indeed, expect major crowing if the Republicans win the seat in 2010. But Sen. Burris presents a big problem for Obama whether he stays in or quits the Senate, for reasons that have little to do with the Senate itself. The chaotic circumstances surrounding Obama's Cabinet picks have a direct relevance on the Burris situation. Though not directly his responsibility, the resignation of Obama's Senate successor -- though well-deserved -- can easily be portrayed as part and parcel of the Bill Richardson, Tom Daschle, Nancy Killefer and Judd Gregg withdrawals. The quick and dirty of it is that Obama and the Democrats look corrupt or incompetent -- or both. The average person can reasonably conclude that Democrats are either happy to have individuals of questionable character in influential positions -- or don't care to do the hard work to figure what might be in the backgrounds of potential appointees. So, it's in Harry Reid's and Barack Obama's best interests to deal with Roland Burris sooner rather than later. The longer he lingers, the worse things look in both the White House and the Senate. There's going to be pain whenever the Burris blister is lanced. Better that it gets done with now. Let new Illinois Gov. Pat Quinn quickly appoint a caretaker replacement who has no designs on the seat for 2010. The faster that this multi-dimensional embarrassment is over with, the quicker it will be for the Democrats to move on.